SUSAN BATES-Red Heart Crystallites Crochet Hook Set. 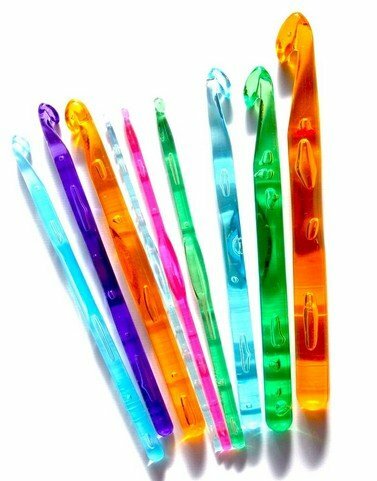 These hooks are beautifully colored translucent plastic crochet hooks. Each fun color is a size so you can find the size you need at a glance. Our famous in line head helps reduce wrist motion for fatigue free crocheting and helps you maintain a more consistent gauge. The 7x3-1/2x1/4in vinyl case is perfect to store your hooks safely. This set includes sizes US G6; H8; I9; J10 and K10.5 (4mm; 5mm; 5.5mm; 6mm and 6.5mm). Imported. Stop going to the store and picking up your crochet hooks one at a time. This four hook set fits the requirements of many bulkier size crochet projects and lets you simply pick a higher or lower size hook so you can properly gauge your project with ease. Made of acrylic, they are colorful and bright and easy to locate when you need them. Includes the following four sizes from medium to large-l/11(8-millimeter), m/13 (9-millimeter), n/15 (10-millimeter), p/16 (11.5-millimeter). The package is sturdy, with pockets, so it doubles as a storage bag to keep the crochet hooks in order by size. 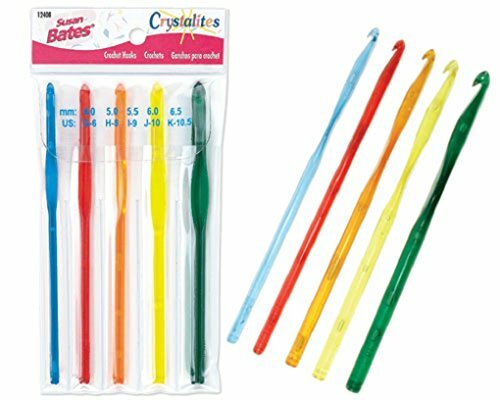 These Susan bates crystallites crochet hooks are beautifully colored translucent plastic crochet hooks. Each fun color is a size so you can find the size you need at a glance. These hooks famous in line head helps reduce wrist motion for fatigue free crocheting and helps you maintain a more consistent gauge. Protect and store this fine set of hooks in the handy vinyl case. This set includes sizes 4 mm, 5 mm, 5.5 mm, 6 mm and 6.5 mm. 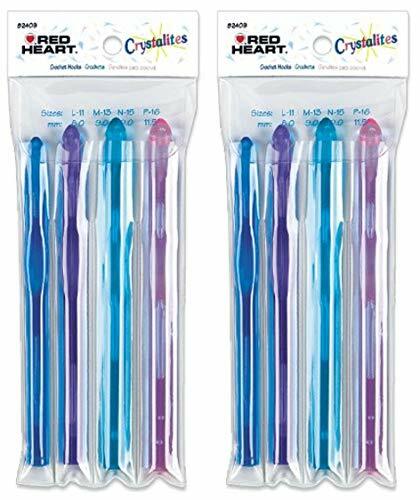 SUSAN BATES-Red Heart Crystallites Crochet Hook Set. 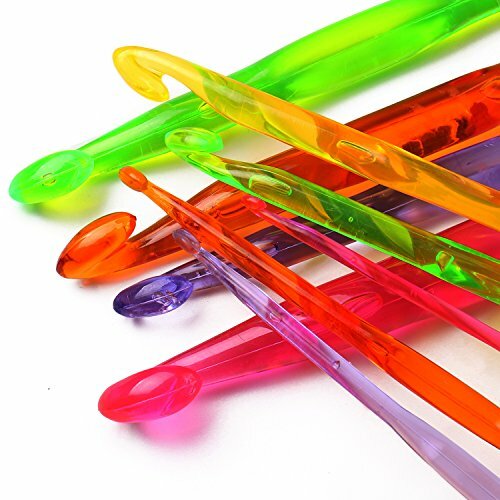 These hooks are beautifully colored translucent plastic crochet hooks. Each fun color is a size so you can find the size you need at a glance. Our famous in line head helps reduce wrist motion for fatigue free crocheting and helps you maintain a more consistent gauge. The 8-1/2x3-1/2x1/2in vinyl case is perfect to store your hooks safely. This set includes sizes US L11; M13; N15 and P16 (8mm; 9mm; 10mm and 11.5mm). Imported. SUSAN BATES-Susan Bates Crystallites Crochet Hooks. 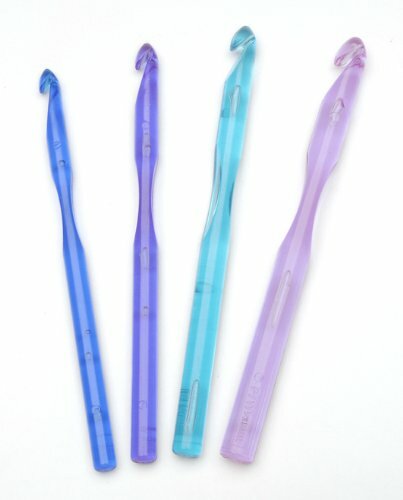 These hooks are beautifully colored translucent plastic crochet hooks. Each size features its own fun color so you can find the size you need at a glance. Our famous in line head helps reduce wrist motion for fatigue free crocheting and helps maintain a more consistent gauge. The larger hooks; sizes L-P; are great when you want to use novelty yarns or double or triple strand your favorite yarn to create afghans; bulky sweaters and scarves that are finished in a snap. Available in size G6 to P16 (4mm to 11.5mm): each sold separately. Imported. Shopping Results for "Acrylic Crochet Hook"